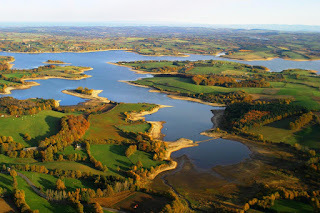 Lac de Pannecière is located in Central France in the Bourgogne region in the magnificent national park of Morvan, roughly between the cities of Bourges and Dijon. The water was, as many reservoirs in France, built shortly after World War II. Lac de Pannecière aimed to prevent Paris from being flooded by the banks of the Seine, which in turn is fed by the River Yonne, which is now so ending in Lac de Pannecière. The latter is very interesting: River carp that eventually reach the Lac de Pannecière are 'stuck' in the reservoir. In other words, there is a continuous flow of new carp from the River Yonne. Lac de Pannecière is known as an easy water, partly due to the huge number of carp. Please note that the water level throughout the year can vary enormously: the highest water level (depth varies from 23 meters to 45 meters maximum, depending on the chosen location) is reached in the months of May and June, while the lowest water level is reached in November. Keep in mind that the seasonal variations may be huge, either drought and almost no good fishing spots at the end of the year and, on the other hand, enormous water flooding of certain areas in the spring and early summer with plenty of great spots for carp fishing all across the lake. Lac de Pannecière is popular with anglers from all over Europe who all dream of the many heavy fish already caught in the past. Lac de Pannecière contains plenty of very nice carp, even with the periodical 'vidange'. Important is the continuous flow of new carp from the Yonne river that feeds the lake. The record carp weighs 26 kilos and was caught back in 2003. Most of the fish are mirror carp, with an average weight of about 10 kg. The probability of catching a carp of 20 kg or more is still very realistic at the Lac Panneciere. Night fishing is allowed on Lac de Pannecière between April 1st and October 31st. There are three sectors that have been identified (see map below) by the local administrator. These are regularly changed, so please inquire before fishing Pannecière. For permits, please contact La Truite Morvandelle, the French regional administrator of the lake, using the details on its website . On site you can also get a permit for the Lac de Pannecière. Permits are sold at Maison de la Presse Tabac in Château-Chinon, Au Bon Accueil in Chaumard, Camping des Soulins in Corancy and Auberge de l'église in Ouroux en Morvan. Check here for full contact details.